After the harpolyre, another example of guitar with so many strings that I doubt that it can played if not like a harp - at least for the upper strings. Actually I have to admit that this Rodolfo Cucculelli 14-string guitar might reach the limits of my understanding of acoustic laws. It looks obvious though I learned to be suspicious with obvious (remember the reverse headstock controversy), but to me it is not possible fort these extra strings - having each a different scale - to be played with the frets and be in tune, am I wrong? I'm aware of the Casio's MIDI and synth guitars, but I've never seen one of these before. It's Casio EG-5 and is a real product of its age (the 1980s, of course) and a wonderful piece of "guitar cheese". The insubstantial plastic body most obviously, and curiously, features an integral cassette player. Whether this is for recording the guitar as you play, or for playing your own backing tracks (or perhaps both) is not clear. This particular example is being sold on eBay by a French seller and looks like it isn't currently in full working order (it'd need some strings for starters). I'm wondering if this was a Japan-only model that somehow made it out to Europe. Has anyone out there seen one of these before? Perhaps you've even owned or played one? Please let us know in the usual way in the comments beneath this post. As we all know, the Stratocaster is the most copied guitar ever. These days many of these plagiarists like to tweak the design to put their own spin on it, but I've never before seen anything quite as odd looking as this. 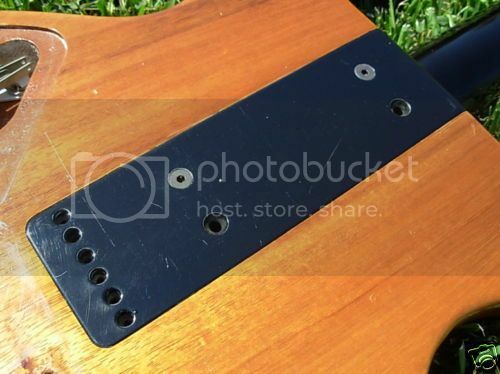 I don't know if this is a mass produced item or a one-off created by an individual (I suspect the latter), but it looks like the maker has used a Strat template for the body except for the area of the treble-side horn where they've switched the template for an upside-down Telecaster. It just looks awkward to me. 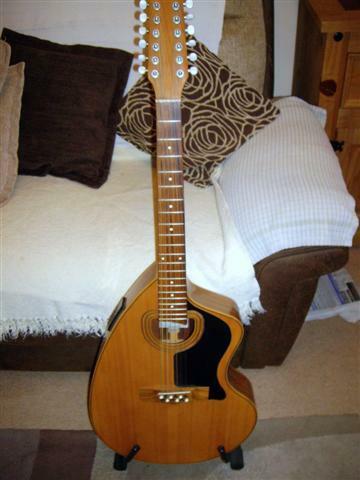 I don't think it would be worthwhile asking the seller anything about this guitar because someone already asked him if he could show a photo of the headstock and he replied he didn't know what a headstock is! But apparently, it's an Uno, not that I'm any the wiser for learning that piece of information. On the subject of the headstock, it's partially obscured in the photo but I suspect that it may well be an uncut "paddle" shaped head as sold by various parts suppliers. I've been waiting for one of these to come up on eBay for ages now, so that I could grab a photo and post it here on this blog. It's an Ernie Ball Earthwood Acoustic Bass and is considered by those in the know to be a truly legendary instrument. These basses were produced between 1975 and 1985, and unlike many acoustic basses which are little more than bass versions of acoustic guitar models, the Earthwood was designed specifically as an acoustic bass. It is a behemoth of an instrument. I don't know if you can appreciate it from the photo here, but this bass is huge. The body is nearly 7" deep. The scale length is 34" but unlike modern basses the neck joins the body at the 12th fret. It has a phenomenal sound and is acoustically very loud. If you want to hear one of these babies, listen to the Violent Femmes whose Brian Ritchie famously plays an Earthwood. It's probably easiest to let the video do the talking! Here's an unusual-looking acoustic instrument from Germany's Cassandra Elk brand. Seeing as it has eight strings arranged in four courses, my guess is that it's a mandola or bazouki-type instrument. It's an interesting design and one that immediately made me think of Bertram's "neckless guitar" concept. I wish there there was a photo of the rear of this instrument so we could see how the neck is formed; is it a distinct piece or is it integral to the body? The eBay listing is in German so we may have to ask Bertam for a translation, I think. I must say that I've always loved the design of the Giannini Craviola guitar such as this example currently for sale on eBay. 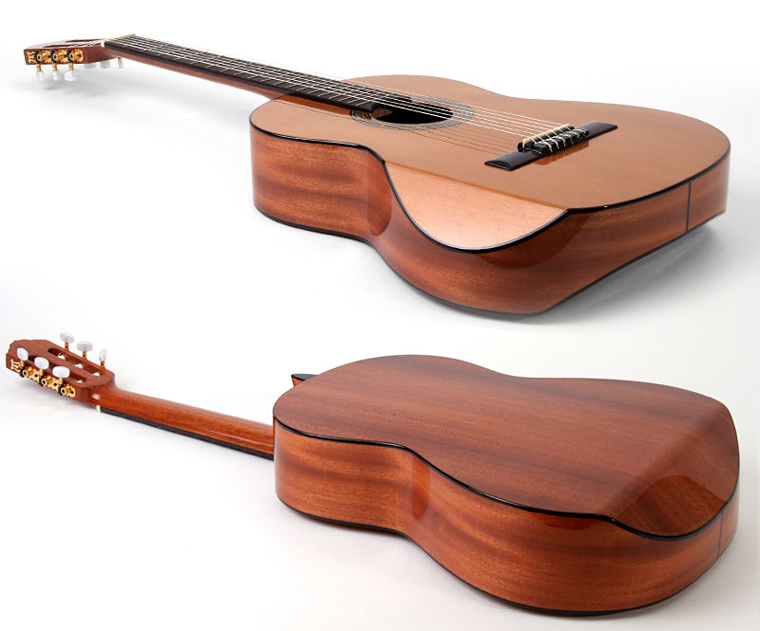 It's a non-traditional acoustic guitar design that doesn't simply borrow from the shape of certain electric guitars. I like that it looks half lute, half guitar; there's something almost baroque about it. However, opinions about the playability of these guitars seems quite polarised in a love them or hate them scenario. These Brazilian-made guitars certainly have a bit of a cult following amongst those that love them, but you'll also find stories of unplayable guitars with warped tops and lifting bridges. Examples produced in the 1970s and 80s were built of laminated wood - which could explain some of the above-mentioned problems - whereas more up-to-date examples are built from solid wood. If you fancy one of these guitars, here is one instance where you would almost definitely be better off buying a new or relatively new example rather than a vintage guitar. I couldn't say what she'd be like as a player, but visually this Soviet-era Bulgarian-made Orfeus Hebros Bass is a beauty. Can you believe that they referred to this finish as "sunburst"? (Surely not, I think the seller must be mistaken). To me, it looks art deco. As with many basses of similar provenance, it's short-scale and has a very narrow neck. This example has a fair amount of wear and tear which would imply that it's seen some use over the years. Either that or someone's been knocking it around a bit. There is not so much information out there about the Yamaha SA-15 - like the SGV it was released in the late 60s but it was never reissued. I don't know it for a long time, but it was not a surprise to discover it, it's the good combination of Yamaha's long-lasting special interest for semi-hollow guitars and their great design work of this period. Of course you cannot not notice the long lower horn - the Japanese trend that I love in Yamahas, Ibanez and Tokais of the psychedelic era, though unusual for a semi-hollow. Being quite familiar with Japanese art and design, it's the first time that I see an electric guitar that has a real Japanese feel, and is not just a copy or a variation of a Western instrument or an extravagant novelty - so I'm quite impressed. Travis Bean guitars were first produced in 1974 and utilised an aluminium neck design, with the neck set deep into the koa body beneath the pickups and bridge with the strings passing through the aluminium centre section for increased sustain. The design later evolved in the early Kramer line of guitars, which similarly had aluminium necks. 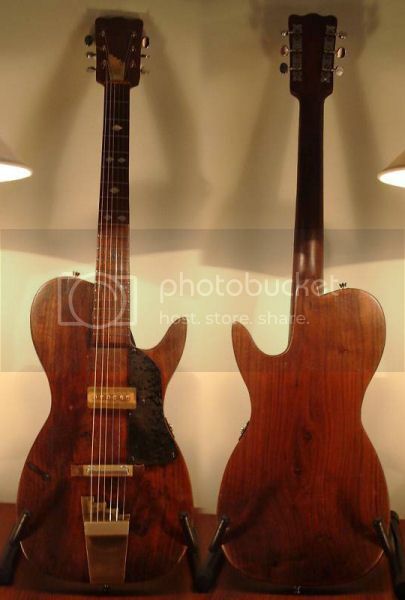 These differed from the Travis Bean design in that each neck was essentially a T-section with two fillets of wood along its length so as to approximate the feel of a traditional wooden neck. 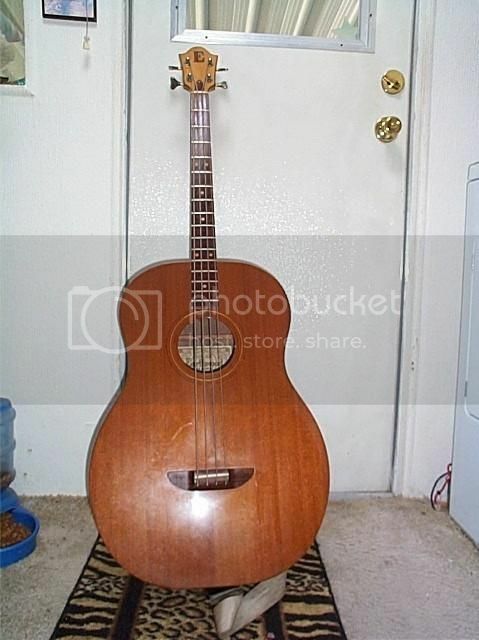 According to the listing this guitar was "built by Travis Bean factory to demonstrate the design and build techniques of the legendary Travis Bean Guitar. 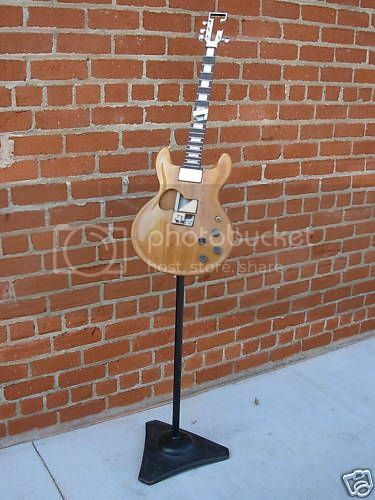 This guitar was hand carried by Travis himself to several musical instrument trade shows and was set up in the offices of the California factory. It is complete with its very own hand crafted stand and traveling box. Was purchased from famed Travis Bean employee Obie." Megadriver are, according to their website, "a Brazilian heavy metal band devoted to videogame music, the creators of GAME METAL". 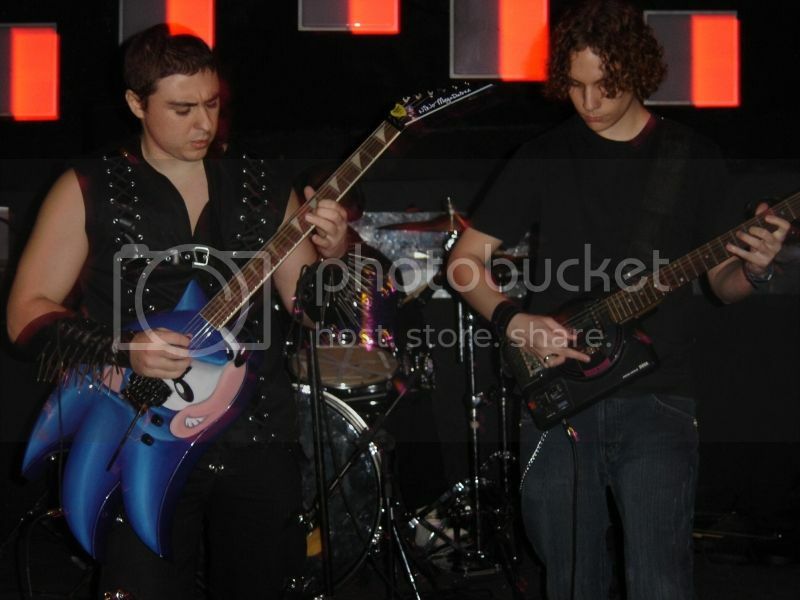 We see them pictured here with a Sonic The Hedgehog guitar and another guitar made from a SEGA Genesis console. 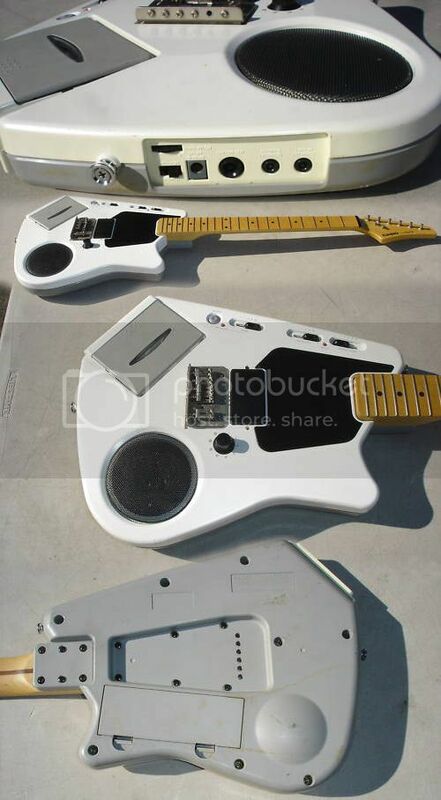 I've seen guitars built from games consoles before and can't imagine that they'd sound that good or would be very solid. However, the Sonic guitar is very cool. Hey, I'm no fan of video or computer games, so what do I know? This Vox Harlem is a model I've not seen before. 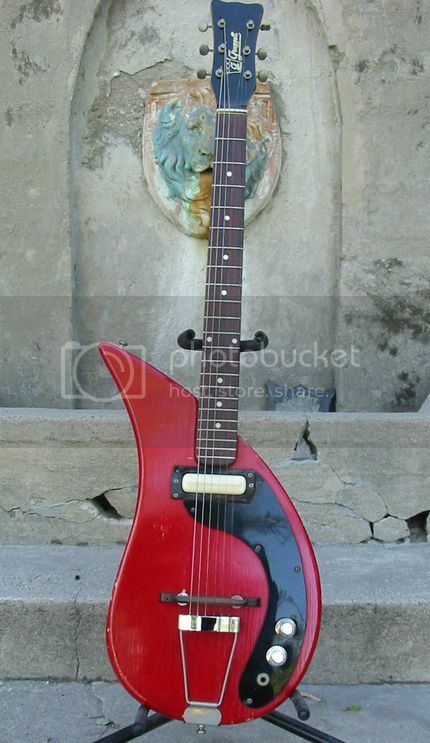 The seller refers to it as being a "vintage Italian guitar", so that makes it one of the Eko-built Voxes. 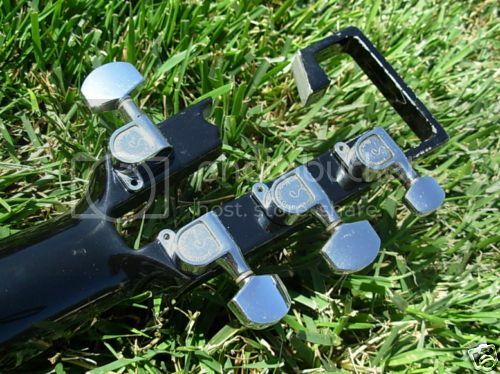 The seller also claims that the treble-side scalloping of the fingerboard is original from the factory, and has not been carried out retroactively. This is way before Yngwie Malmsteen and before even Ritchie Blackmore had scalloped fingerboards on their Strats. Could this Vox Harlem be the first electric guitar with this feature? 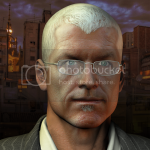 Does anyone out there know of an earlier example? Pre-electric guitars, it is my understanding that some baroque guitars had such scalloping, but I don't know the full history here. Again, if anyone can fill in the blanks, please leave a comment below. The Michael Jackson money-making machine continues to roll on after his death (if anything, it's gone into overdrive) and, no doubt, will continue to do so for many years to come. Even guitar builders are getting in on the act now it seems, witness this guitar being sold by an Italian seller on eBay. I won't say any more - I'll just let the photograph do the talking. 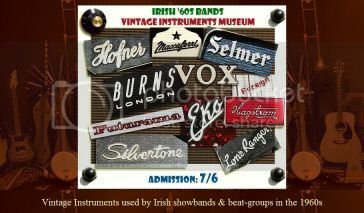 I just came across your blog and thought that you might like to see my site with photos of guitars and basses played by Irish bands in the '60s. It's worth having a look through the pictures here; it's quite interesting to see the instruments used by working musicians back in the 1960s. Not everyone could afford the likes of Gibson and Fender guitars, you had to make music on what was available. I'm not saying that all these instruments were bad, but Egmond guitars - for example - do not have a reputation for being the most playable instruments ever made. I was intrigued to see a picture of one guitarist playing a Wandre Krundaal Bikini guitar with the amp and speaker pod attached. I suppose someone had to play them, I've never seen any photographic evidence before! 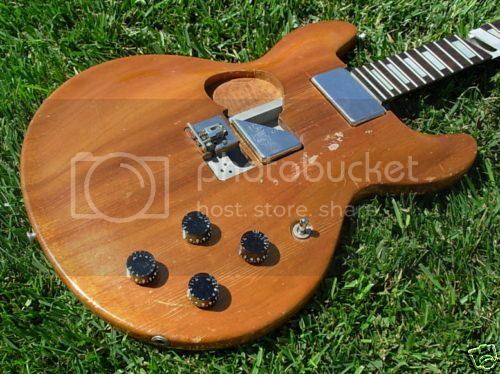 The auction for this homemade electric guitar is finishing on eBay very soon. I love stuff like this; it's a case of a guy wants an electric guitar so badly but the only way he's going to get one is to build it himself. Luckily he gets some sound advice from a legend! My grandfather served in the Korean war and was entertained by Les Paul’s band during his service, upon returning home from the Korean war he was very excited to learn to play electric guitar. Being from an area of little means (a poor coal mining region) he decided to manufacture his own, there was a walnut tree that was struck by lighting a couple years earlier and died. He cut down that tree and from the trunk section he salvaged a decent solid piece of wood,this was the summer of 1958, at this time he was working as a coal miner an his schedule be came demanding so he had to stop working on his guitar project,he spent many evenings studying guitar design and planed to make a conventional two piece guitar being neck and body separate pieces. Sundays were his only day off from work and he spent afternoons at his church practicing his playing with the church orchestra, that spring at the Tula county fair, grand father learned that Les Paul was going to play three evenings he went each night bringing the walnut hopeing to show Les this wood and get advise about his guitars construction. Because of his excitement and many question about the guitar, the two of them; grand father and Les examined the walnut and Les said his guitars were two piece because the neck is made from expensive maple and to keep costs down he used adler for the body,but he suggested since the walnut was large enough why not try to build a solid one piece guitar and he gave grand father an address to write him and send a photo when it was completed. By june 1959 grand father completed the shape of the body, sort of stratocaster style with a thick neck, he felt a thick neck for strength and his large hands would be best. At that same time a neighbour’s home caught fire and burned, this neighbour played guitar an as it happened his Silvertone acoustic guitar’s body was destroyed, my grand father asked for it's remains and he salvaged the finger board nut and tuning keys. 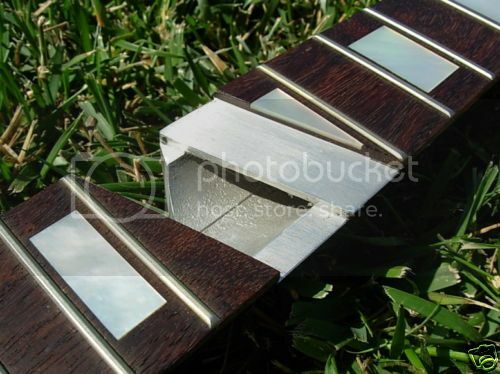 Grand father wanted to customize the fingerboard so he cut chrome pieces from the bumper of an old car shaped them and inlayed the chrome into the finger board, also from the burned home he took from a dining table a piece of formica, a faux pearl table’s top surface and applied it to the headstock surface. At this point he bought a used tail piece, a bridge and strings and he was playing his new guitar he recalls his total cash investment was under four dollars, he was very happy and after a few adjustments everyone agreeded that the guitar played very well. Grandfrather Oven had some pictures taken and he mailed the pictures to the address Les paul had given him, along with the pictures he sent a letter asking for help with how he was going to install some pickups, to grandfathers amazement Les paul sent him two single coil pickups that he had wound by hand while developing a design in 1952 along with a diagram and two pots for volume and tone, Les asked for him to route two pockets to set the pickups into, grandfather was afraid the pockets may weaken the body causeing it to crack, so he screwed the pick ups to the top of the body as well as the pots with wires external as well.grandpa Oren played his guitar at church for fifteen year he studied jazz and played at the same fair where he recieved help from Les Paul many years earlier. My grand father retired in 1965 and moved to New Orleans Louisana so he could play jazz and learn more about the music he loved, this was the only guitar he ever owned,he joined a band called the Bluzers and played at many night clubs in the french quarter, a down town section filled with blues and jazz clubs. In 1979 grand father passed away, his grand son my twin brother Gene Du Buque wanted to learn to play and so he inherited the guitar, my brother learned to play on this instrument,he liked the sound but felt the guitar was ugly. He removed the pick ups and disguarded the guitar. Gene put the pick ups in a fender telecaster and later sold the telecaster,I kept the guitar, over the year i often thought it would be wonderful if some one might appreciate it as my grand father did, so Denis may it bring you happyness. I think that's a great story. It's nice to know that the guy used the guitar throughout his musical career. I bet it had that certain mojo. Great also that the grandson learnt to play on the same guitar. 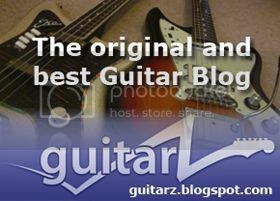 I think, however, that it is such a pity that the guitar is not now destined to stay in the family. It's not necessary to say much, the picture of this Ergonomic Guitar Iberica 1C tells the obvious: you take the most regular classical guitar and bevel it a little bit where it's necessary and you have a much more conformable instrument. Not only electric guitars deserve ergonomics improvement, and the traditional form is not obligatorily the better one! Didn't think I'd ever be surprised by a Gibson Les Paul - until I discovered the S-1! Love the Flying V headstock, and the pickguard shape simulating a SG on top of the Les Paul body is brilliant... Together with the Marauder, it was an attempt of Gibson to attack the Fender niche with its 3 single coil pickups on a flat-top. Didn't work though, and the 2 models were discontinued in 1980... I won't tell much more, these guitars have their pages on Wikipedia if you want extra information! This guitar does have a very 80s vibe to it - perhaps it's the metallic lilac finish. It wouldn't have looked out of place in any of the hair metal bands of that era. Oddly, it doesn't have a locking trem - just a regular one, but if you're like me that will be something in the guitar's favour. Egypt Guitars were built in Glasgow, Scotland, and the business is still going although these days mainly functions as a guitar repair shop. If you check theie website you'll see an Egypt Pharoah Isis from 1985 that shares the same body shape as the guitar pictured above, only in mirror image. (Hey, Gibson don't hold the monopoly on "reverse" body styles). Anyway, the auction for the Karnak Luxor is finishing in a little over 4 hours as I type this, so why not bid? You could snap up what looks like a very nice guitar (although possibly playing in a 80s cover band might be a pre-requisite!). Additional: It didn't sell and has been re-listed here. 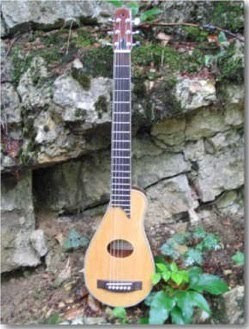 I found this guitar on a German-Swiss site and it might be called a Dulci but I can't find anything more about it... I'm not even sure if it's really a guitar - is it a travel acoustic one, a 6-string ergonomic ukulele or some hybrid I've never heard of until now? 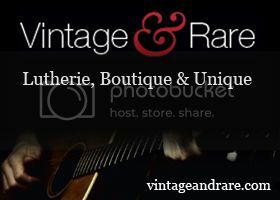 Labels: acoustic, travel guitars, What's that guitar? 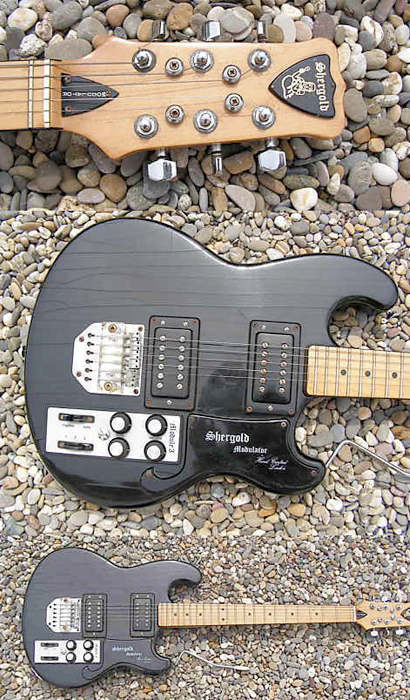 This is the double-neck Shergold Modulator inspired by Mike Rutherford's custom model. Of course it doesn't have its characteristic splitting/recombining system (if I understand well, Rutherford claimed Shergold's exclusivity for this innovation, and I don't think that there's been any other builder that made a similar guitar) but it has the typical 12-string guitar neck on top and an quite unusual 8-string bass neck (Rutherford has been Genesis's bassist and rhythm guitarist behind Anthony Phillips then Steve Hackett before becoming the front guitarist, that had him develop a special style requiring a special instrument), plus the Modulator long upper horn that makes it look much better than the single neck (what a long sentence, and all these brackets!) . If you want to know more about Shergold guitars, you can have a look at the most exhaustive website about them or wait a few weeks to read GL Wilson 's '500 guitars' book! This is a Shergold Modulator 3 - that I first noticed because of its square knob plate, the kind of things that I love in a guitar (the general shape is not so exciting)! Then I deepened a little bit the subject and I discovered that the square knob plate actually allows to interchange the electronics of the Modulator series - there are 6 versions -, and that Shergold was a kind of spin-off of Burns - actually a company that provided woodwork to Burns and Hayman and other British brands before making their own guitars in 1975, first from left over material. 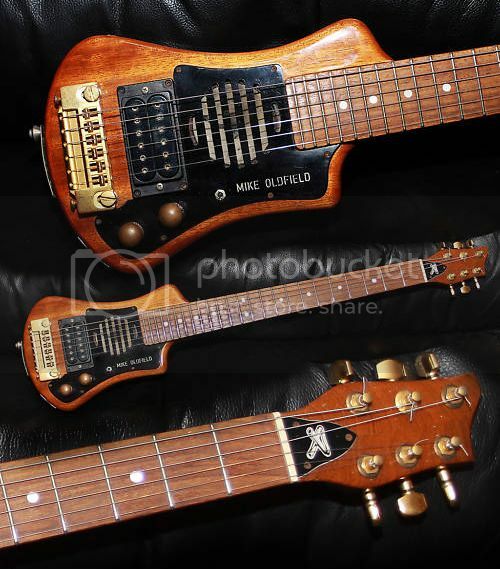 Shergold's guitars and basses have been used by Joy Division / New Order musicians, and Genesis's Mike Rutherford played a famous double neck 4/12 custom guitar that could be reassembled in different combinations of basses and guitars... - I'll come back on Shergold double-necks in a following post. Uh-oh! You know you're in for trouble when you see a Tennessee-brand guitar. They are often very wacky instruments, but don't be fooled as the workmanship is shoddy and the instruments themselves are reported to be virtually unplayable. But let's put aside the provenance for this discussion. 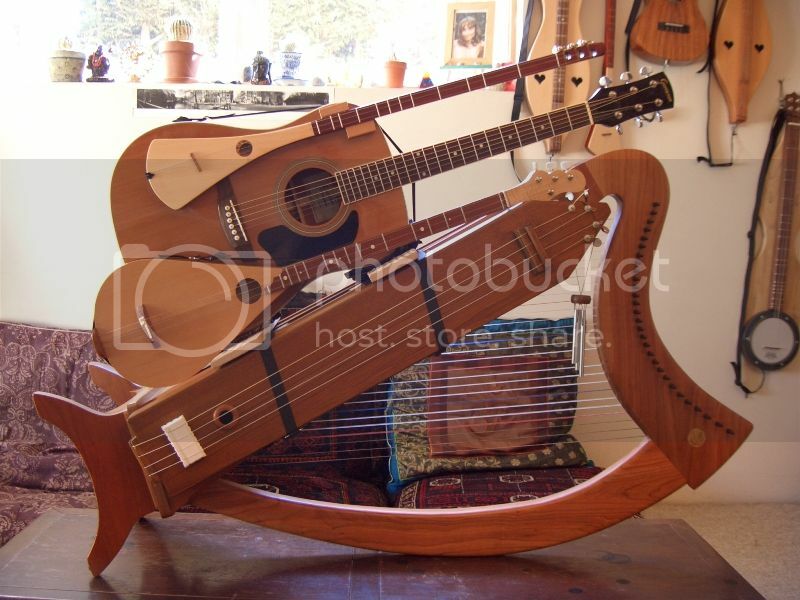 Just look at this thing: it's a triple-neck comprising 8-string bass, 10-string bass, and 6-string lap steel. 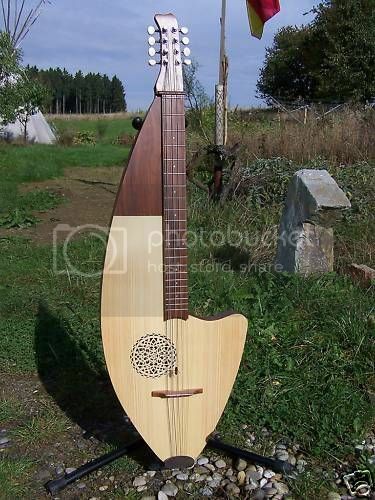 Why would anyone need that combination of necks on a single instrument? To start with, how many bass players double on "lap steel"? 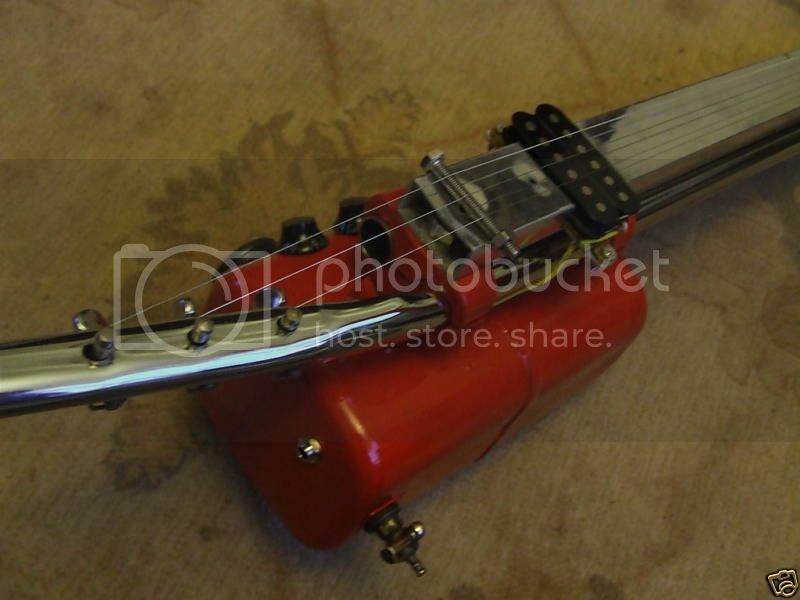 Not that this could ever be a real lap steel. Is the player supposed to un-strap it mid-song, sit down and lay the instrument on his lap for a lap steel solo? Perhaps the "lap steel" neck was added because it was lying around at the factory at the time this ridiculous instrument was assembled. Let's forget the lap steel neck. What about the two bass necks? Why would any bassist ever need a 8-string and a 10-string on one instrument? (That is to say, a 4-string and a 5-string with doubled courses, rather than 8 and 10 individual non-paired strings). Surely if you needed to play a song that required both 8-string and 10-string bass, all you'd need would be the 10-string neck and you could ignore the low B course in the sections that "require" the 8-string. In the same way, I can't see why anyone would ever need a 4-string and 5-string bass combination on the same instrument. I could understand a 4-string and 8-string, or a fretted and fretless, but this instrument shown above offers nothing of advantageous use. It's utter nonsense, and as I've commented on previous occasions, Tennessee guitars seem to be put together by people who know nothing about guitars. 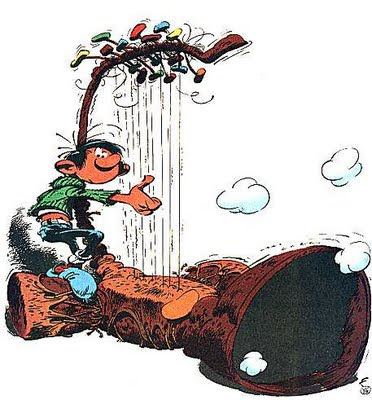 OK, GL Wilson stunned me with his Omstrument and there would be no possible answer to this extreme instrument if genius Belgian comics artist Franquin didn't invent the infamous Gaffophone. The Gaffophone is supposed to have an horrible and destructive sound (Gaston being himself a terrible musician, also playing sousaphone), being thus a frequent reference and joke amongst continental European guitar and brass players. Some Gaffophones have been built for real, but of course could not match its supposed terrific sound. This week I've been listening to "I Told You I Was Freaky", the new Flight Of The Conchords album featuring songs from Season 2 of their TV series. 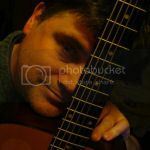 I wanted to include the above clip on this blog because I just love those guitars they are playing. Yes, I know they are just props. Basically, Jemaine's guitar is a video editing console with a guitar neck attached to it, and Bret has a similarly obsolete-looking video mixer with a bass neck. Imagine if guitar synths were really as cumbersome as these! They do bring to mind the Stepp MIDI guitar. In our previous post about Uli Jon Roth's Sky Guitar, Bertram, my co-blogger here at Guitarz, made a note in the comments appealing for "Less frets, more strings!" Is this enough strings for you, Bertram? 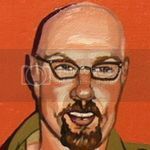 With a combined total of 46 strings, the Omstrument is the creation of Jack Haas and is a gestalt instrument comprising harp, guitar, longneck dulcimer, strumstick, and tanpura. And before you ask, yes, they are supposed to be played together at the same time. Before anyone else comments, yes I am aware of Pat Metheny's 42-string Pikasso guitar created by luthier Linda Manzer. It's a crazy-looking guitar with strings all over the place, but surely more portable than the Omstrument! Thanks to KC for jogging my memory. The guitar that the Gruggett Raindrop reminded me of was Uli Jon Roth's Sky Guitar, as seen pictured here. Uli Jon Roth has (or at least has had) at least five of these "Sky" guitars. They are made by a British luthier, and also used by the guitarist from Fair Warning. The first three Sky guitars were as follows: One had 36 frets, another had 42 frets, and a third one is fretless which was used on the Beyond the Astral Skies album. In an April 2001 Guitar Player Magazine interview, Roth reports that the guitars are either fretless above the 30th fret or have whole step fret spacing above the 27th fret, with 35 effective (half step) frets. All of the Sky guitars with frets have extensive fretboard scalloping as is favored by Swedish guitarist Yngwie Malmsteen (who was influenced greatly by Roth) and many neoclassical metal guitarists. The Sky guitar's pickups are custom 4 coil humbuckers made by John Oram, with one guitar having an Oram pickup hidden under the 24th fret. The guitars named Mighty Wing and Destiny each have 7 strings and the others have 6 strings. The 7th string is a low B string. The US company 18th Street Guitars made 50 commercial versions of the Sky guitar in 2004, each reportedly selling for $18,000 USD. Someone has applied a very poor imitation Fender logo to this cheap and nasty vaguely-Telecaster-styled guitar from the 1970s. 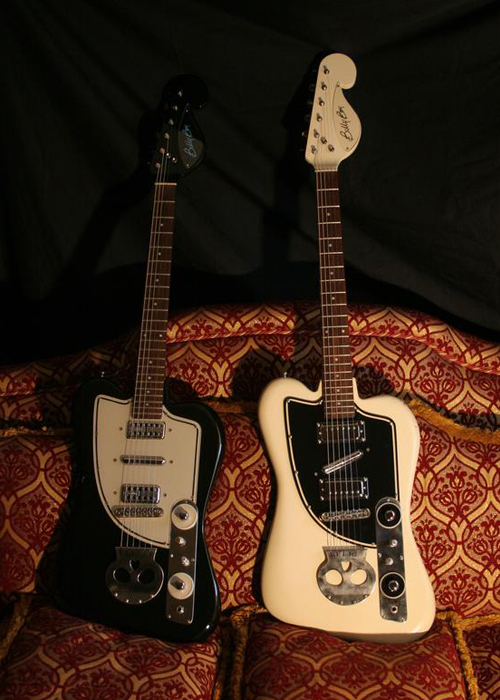 These appeared under various brandnames; it's probably one of Teisco's poorer efforts. So, how much do you think the seller is asking for this dreadful example? Would you believe €9,990.00? That's approximately £8,939.96 or US$14,754.10 which is quite frankly outrageous for this horrible plank! 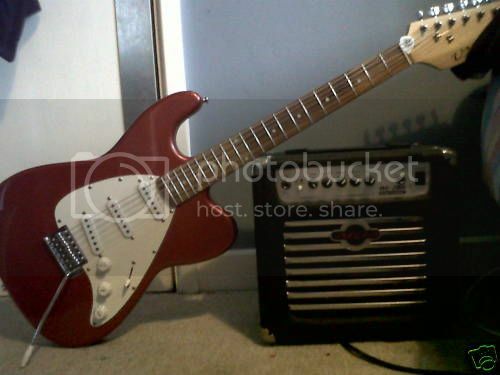 I'm unsure as to whether the seller is incredibly stupid and really thinks that this is a long lost Fender prototype or whether he/she is aware that it's a pile of crap and is hoping someone out there is stupid enough to pay that kind of silly money for something that is actually hardly worth 50 quid (and that's being generous). 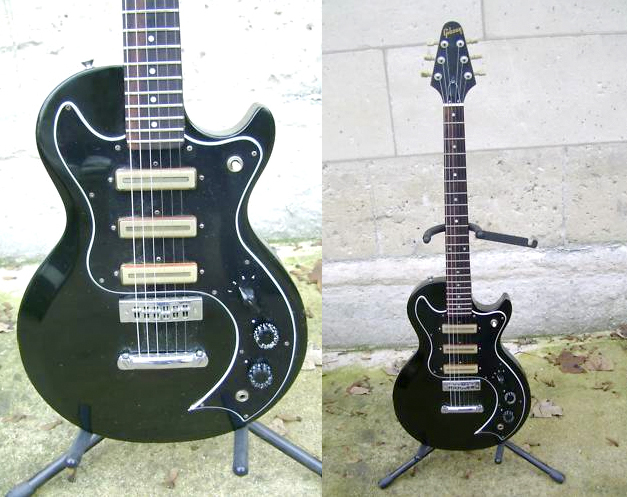 My French isn't very good - perhaps someone can translate the listing and what crazy claims the seller is making about this sorry guitar. 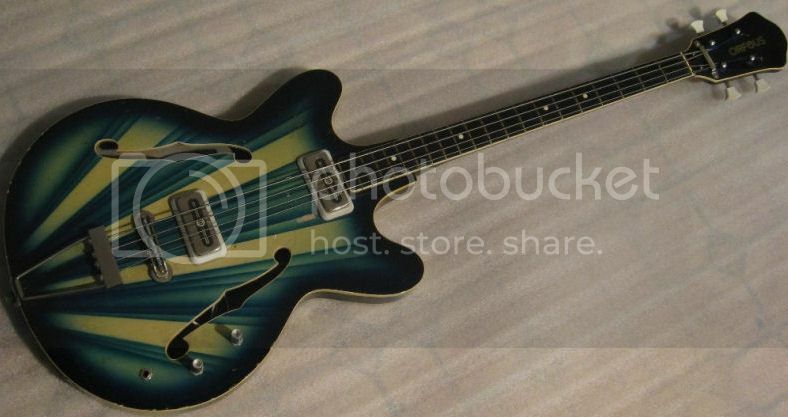 This Gruggett Raindrop was apparently one of only six such guitars and was built in 1966 for a band called - appropriately enough - The Raindrops. Bill Gruggett, the maker of this guitar, also built guitars for Mosrite and Hallmark Guitars back in the day, and is currently working with the re-launched Hallmark company. The Raindrop guitar reminds me of a more modern guitar, possibly 80s-era, but I can't quite put my finger on what it might be. I wonder what happened to the band The Raindrops too, incidentally. Anyway, browsing for what's going on in the field of Italian guitars (you remember that Italy is providing regularly amazing vintage guitars for this blog), I just discovered the Billy Boy "brand" - well I think that the company is just one guy! Billy Boy guitars don't have a proper website but get along quite well with a MySpace - if you're interested, go there and check the many pictures presenting his different models. Billy Boy has just three guitar models, the solid body that you can see on the picture, a semi-hollow and a Jumbo model - there are also some basses. 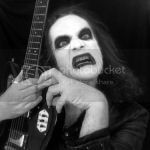 His trade mark is the cartoonish skull bridge that exists also with a trem (if you don't like it, you can also ask for another bridge). Since his production rate is not high enough to produce stock guitars, most of Billy Boy's are one-offs, not for the shape, but for the pickups and knobs combinations. 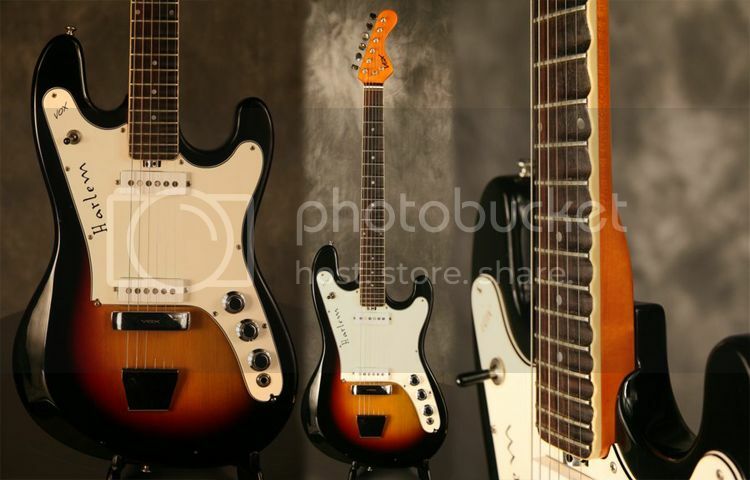 The picture I chose shows guitars with two humbuckers + one central lipstick and they are already slightly different. If you check other guitars on the Billy Boy MySpace, you'll find quite radical pickup combinations that I'd be embarrassed to describe here! 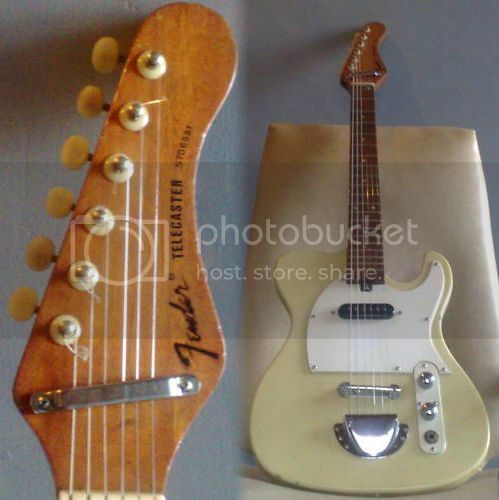 We've seen one of Mike Oldfield's guitars up for auction previously on Guitarz. On that occasion it was his ex-Marc Bolan Telecaster which was the main lead guitar used on his now legendary Tubular Bells album. This time, it's a one-off travel guitar with integral amp and speaker which was presented to Oldfield by the German arm of his record company, Virgin. 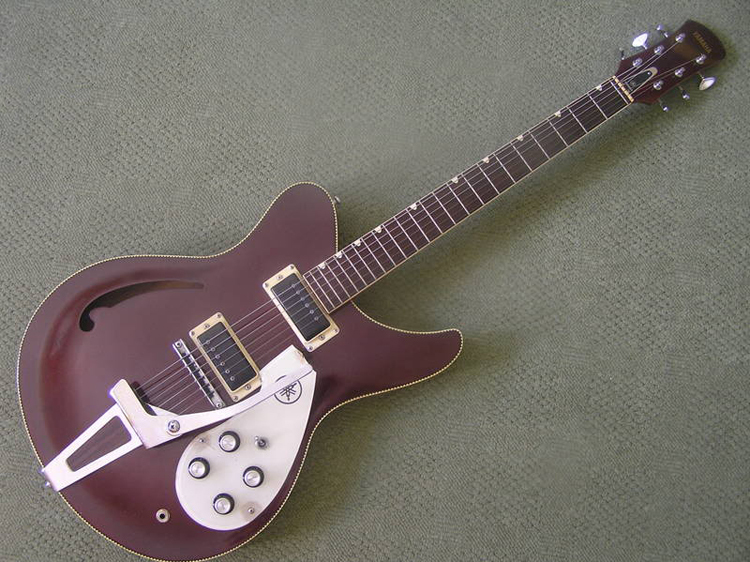 The guitar appears to be modelled along the lines of a Hofner Shorty (possibly it is a customized Hofner Shorty) and bears Oldfield's name on the pickguard and has a Tubular Bells logo on the trussrod cover. I remember seeing Mike Oldfield demonstrate this very guitar on a Breakfast TV show back in 1983 (or thereabouts) during an item in which he was showing off part of his guitar collection. I've tried and cannot find this clip on YouTube. I believe he mentioned taking it with him on aircraft flights. I couldn't say if it was ever used on any of his records; I suspect that it was purely a practice guitar.